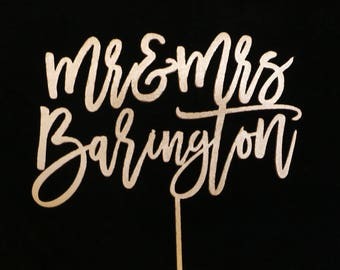 Custom Calligraphy Wedding Cake Topper Mr and Mrs Gold- Customize your special day with this personalized wedding cake topper. 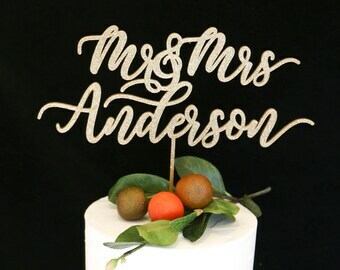 **When purchasing** After adding Custom Wedding Cake Topper Mr and Mrs Cursive to your cart input the LAST NAME that you would like on the topper in the text box under "Note to Haymade" If you are not prompted with a customization box. If you have any questions please do not hesitate to message us. This is laser cut from 1/8 inch wood. Current processing time is 5-7 business days. (roughly a bit over one week from purchase date) It will be shipped USPS first class 3-5 days. We offer priority shipping (1-3 days) at checkout but if you are in a rush please convo us. Upgrading to priority shipping does NOT change the processing time, just the shipping method the package is sent. 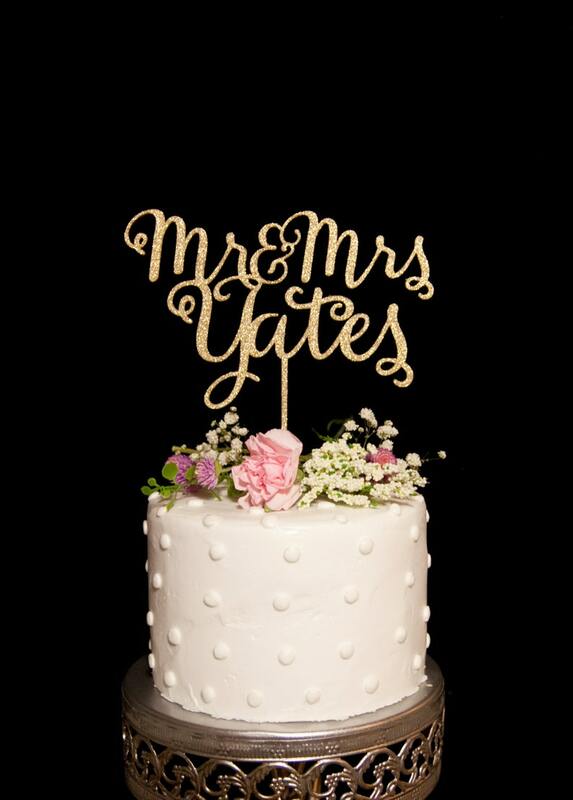 This Mr & Mrs Yates listing is only for a custom Mr & Mrs cake topper. If you purchase this listing and write a custom phrase your order will be cancelled. 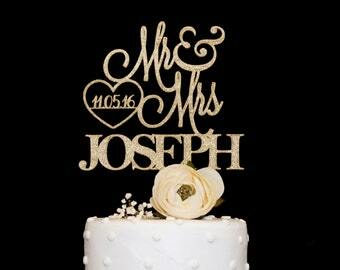 This topper varies slightly in size depending on the name, but the size is roughly 6" by 8". By default, the toppers come with only the front face painted. The back is a plain MDF wood. If you will be needing the back side of the topper painted please select "Yes, please" in the drop down menu. QUESTIONS/COMMENTS/CONCERNS: Please if you have any questions OR want to make a change feel free to message us. Just as described. It did smell strongly of paint, so order in advance so it can air out. Beautiful!! Loved it! 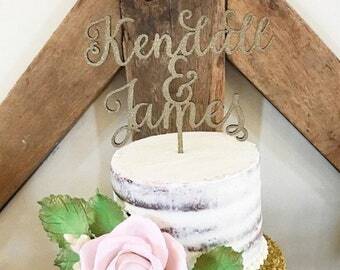 Will make the perfect topper to our awesome cake on the best day ever! 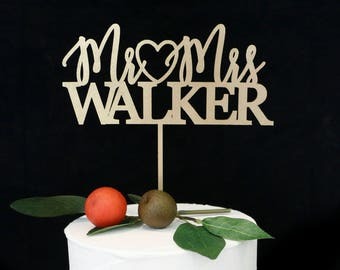 We accept any major credit cards, Paypal and Etsy gift cards. Etsy will send you a conformation email once your purchase is completed. If you DO NOT receive an email, something has more than likely gone wrong and we probably did not receive your order. Please check your Etsy account and convo us if need be. If you are unhappy with your purchase, please message me and I will try my best to correct the problem. I want you to be happy! Please please convo me BEFORE writing a negative review, because most of the time it can be fixed with a conversation that will leave us both happy. I am sorry but because of the nature of these items, unless they arrive damaged or defective, I can't accept returns. 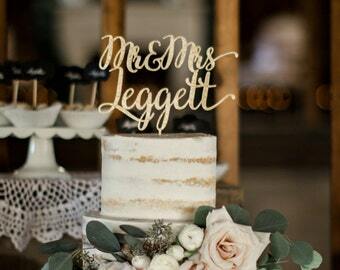 Was your old address linked to your Etsy account and you only realized once you got the conformation email? If so, OMG I've been there. I mean how many places do I need to update my address once I've moved? NO WORRIES! Just please convo us the correct address. 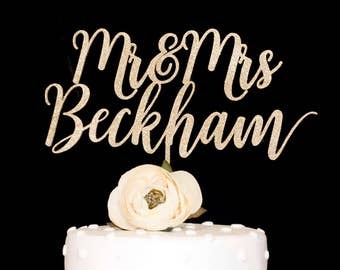 Etsy does not let me go in and change your address until I am shipping your order BUT I will add a note to your invoice with the correct address, so at the time of shipping I will input it. Don't trip chocolate chip! These things happen. Did you totally forget the date with the craziness of life? Been there, also. We have about a ONE WEEK turn around time and if you didn't realize that and need to cancel your order, I totally get it. I won't take it personally. That being said, if you did forget to order with enough time, you can convo us to see if I can squeeze you in. Sometimes, I can be magical. Plus you're interested in my shop so I already like you. 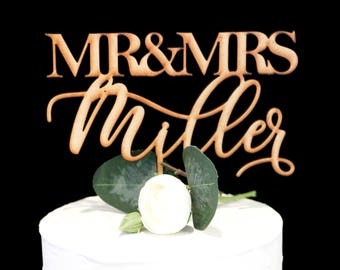 After the one week processing time, the cake topper will be sent USPS 2-5 days, unless you selected the upgraded priority 2-3 day option, and both will come with a tracking number that can be found in your shipping conformation email. If you are an international customer please be aware that your country may charge you customs duties and taxes on your purchase. These duties and fees are your responsibility. These are fees that we cannot quote you for and that we will not be held responsible for. We ONLY charge you for actual shipping fees. Returns and/or refunds will not be accepted due to customs fees. USPS First Class International Mail generally takes about 10 business days to arrive but can arrive quicker or much later. It just depends on your location.